Martin Provost’s The Midwife’s original title “Sage Femme” , while meaning midwife, also literally translates as Wise Woman. This play on words goes a long way into conveying the story at the heart of this thoroughly enjoyable and deeply moving, if not entirely convincing story. Staring Catherine Frot and the legendary Catherine Deneuve, the film manages to have an indie French cinema sensibility all the while dealing with universal themes relating to love, loss and redemption. Middle-aged midwife Claire leads a fairly banal existence which she shares between delivering hundreds of newborns into the world, and quiet days looking after her allotment space by the Seine river in Paris. One day Claire receives a call from someone she hadn't heard from for over thirty years, an acquaintance she had long thought dead has come back into her life to wreck havoc with her sedate existence. Béatrice (Catherine Deneuve) was once married to Claire’s father, a champion swimmer in the 70s, when she suddenly disappeared without a trace leading to a tragic incident for which Claire has difficulty forgiving her. Unwilling to play whatever game her former step mother is playing, Claire refuses to have her back in her life whatever her motives. 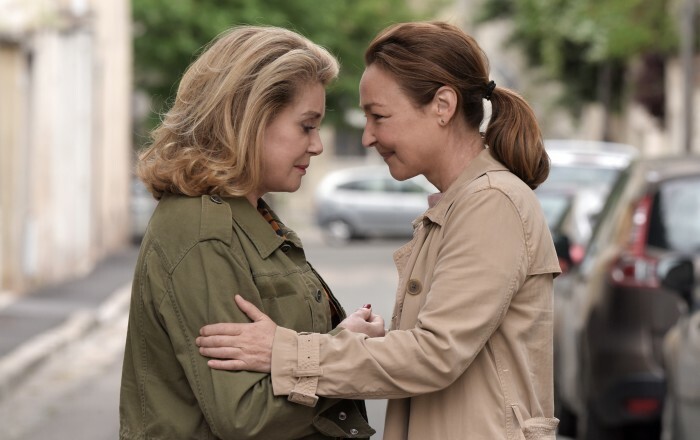 Structured around lengthy hospital scenes of the tireless Claire and a bourgeoning relationship with handsome middle-aged truck driver Paul (Olivier Gourmet), The Midwife doesn’t always manage to get the tone right, but this doesn’t seem to matter much when the two women are reunited. Deneuve and Frot play off each other beautifully, their characters are in exact contrast of each other, with Beatrice having lead an exhilaratingly carefree life without ever giving any thought to the future and Claire being the least adventurous of the two. Soon Claire finds herself involved way more that she would have hoped for in the older woman’s life, which results in a deeper understanding of what has motivated her to leave thirty years ago. Martin Provost who both writes and directs this hugely endearing movie, doesn’t always get things right, but when he does he manages to offer a beautifully crafted piece of filmmaking. Tonally the film is all over the place, as it can't quite decide whether it wants to be serious or semi-comedic, but on the whole and if you give it a chance, you will come out enriched by having watched this highly entertaining and brilliant acted production. A beautiful French gem which might get lost in this summer’s superhero heavy programming, but which is sure to find its audience nonetheless. The Midwife is out on July 7th.